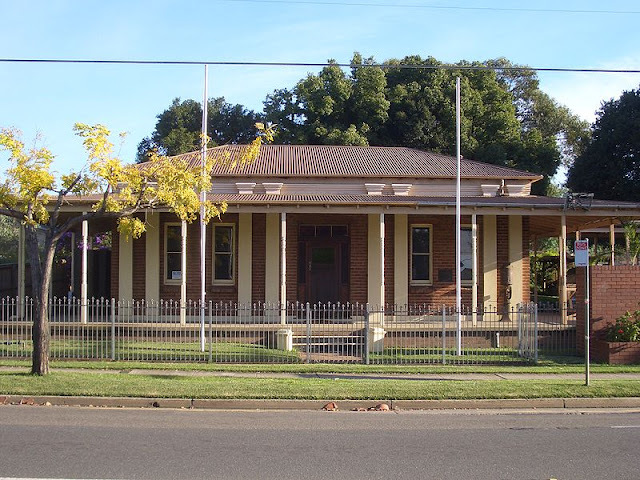 The Fairfield City Museum is located on The Horsley Drive in the western suburb of Smithfield. The museum was built in 1913 in the Edwardian archictectural style with touches of Victorian style, as the first council chambers of the Municipality of Smithfield and Fairfield, which was incorporated in 1888. The council chambers moved to Fairfield when it had become the commercial centre in the area and this property was sold and converted into a family residence. The local council recognised the historical value of the property so bought it again and opened it as a museum in 1983. Numerous buildings were also moved or erected on this property to create a village atmosphere of the early 1900s. The Stein Gallery was built in 1995 and was designed and positioned to compliment the style of the old council building beside it. This art gallery is named after one of the foundation members. It's a nice building. I particularly like the porch and columns. I like the clean lines of the architecture. Lovely! We enjoy the historical village type of museum -- much more interesting than dusty collections in one building. This is a beautiful building and I'm glad they were able to buy it back for public use. sadly, but from your pictures of Sydney Harbor! I am glad they kept the old veranda and poles. Even though the old council chambers were not 19th century, the building still looks Australian, I think. What a beautiful contrast to see this city and its photography. Many times feeling like an oasis, best to be conserved in a museum. It looks like a great place to and at the same time enjoy the fine architecture.